Rather than crocheting an entire afghan or other item as one piece, the Mile-a-Minute method creates strips that are later stitched together with yarn, making it a good project for beginners. As long as you know basic slip, chain, single and double stitches, the Mile-a-Minute method works for novices and even more experienced crocheters. A Mile-a-Minute afghan starts with a row of shell crochet strips framed by a border once the strip reaches the desired length. The strips are then stitched together to create the final project such as an afghan for a twin, queen or king-sized bed. Create a gauge at least 4 inches square before you begin work. This allows you to know how many stitches make up an inch. Count the number of stitches compared to rows. 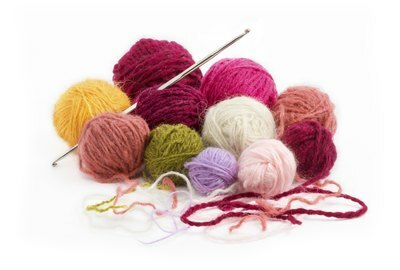 If the stitches are too large, use a smaller crochet hook or increase yarn tension. Create a loop of seven chain stitches joined by a slip stitch. Chain three stitches, and then work three double crochet stitches in the loop. Chain three stitches; work four double crochet stitches in the loop. This forms the first shell of the strip. Add three chain stitches and turn the strip. In the chain three loops from the first row, work in three double crochet stitches, chain three stitches and work four double crochet stitches in the chained loop from the first row. Add three chain stitches and turn the strip. In the chain three space from row two, work three double crochet stitches, three chain stitches and three double crochet stitches. Continue with this row until the strip is the desired length based on the size of afghan you plan to make. Repeat Steps 1 through 3 to create the needed strips for your afghan. Attach yarn at the edge of the first shell to create the border. Add three chain stitches and work 12 double-crochet stitches in the center end of the shell to form a curve. Work three double-crochet stitches in turning chain space along the edges of the strip. Work 12 double-crochet stitches in the center of the top shell to form the top curve. Next work three double-crochet stitches in each chain space down the other side of the strip. Join the yarn at the top of chain three that began the border and end off by cutting the yarn and drawing it through the last loop. Join the strips by using a single crochet or slip stitch along the tops of the double-crochet stitches or along the sides of the strips, leaving the curves open. The curves form a scalloped edge along the top or side of the afghan, depending on whether the strips are placed lengthwise or by their widths. Mile-a-Minute strips can be done with one color, a separate color for the shells and a second color for the border or a pattern of colors for the shells making it simple to personalize a project. While the strips can be made to any length, there are standard comforter sizes that can be used for afghans. Afghan sizes for cribs are generally 36-by-54 inches; twin beds, 69-by-90 inches; double beds are 84-by-90 inches; queen beds require 90-by-95 inches and make a king at least 106-by-95 inches, which allows for a bit of overhang on each bed type. Keep the tension even as you work. Beginning crocheters often make stitches too tight or too lose. Practice making stitches until you feel comfortable with the tension, by not holding the yarn too tight or too loose as you crochet. Learn how to stitch an afghan using the basic Tunisian simple stitch, then learn the slightly more challenging chevron variation.